As I said in Part II, the kitchen had come along further than that post would show. So, this post will show up-to-date pictures of their kitchen. Work is coming along nicely. From the front entrance, you’ll now be able to see into the kitchen. This is due to the wall that separated the dining room and kitchen being removed. This is gives a MUCH more open feel. The visitors to their house will now see the double wall ovens, plentiful pantry, integrated refrigerator, and the beautiful cabinetry work. 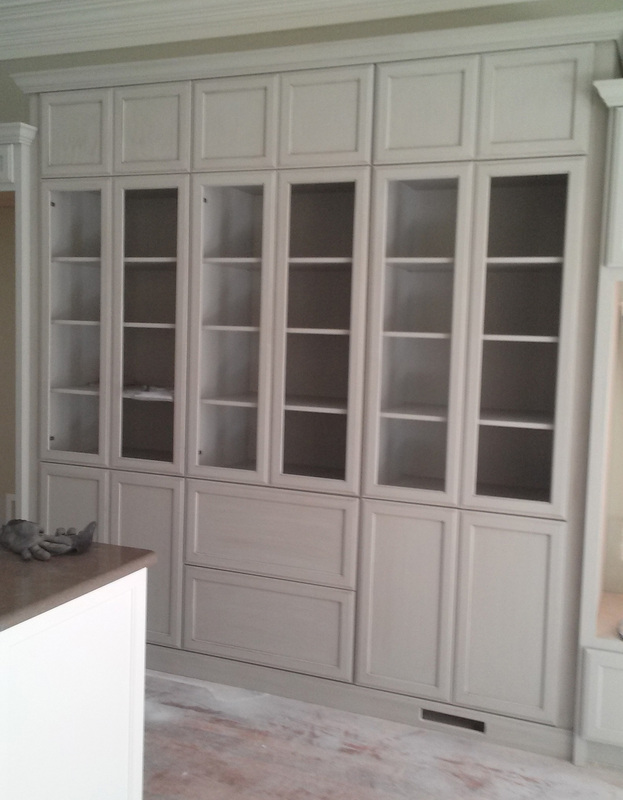 Side note on the cabinets: All of their cabinets are being custom-made by Kenny Bennett of Bennett’s Cabinets, in Columbia SC. His work, as you’ll see in a bit, is wonderful. Please check out his website because he does beautiful work and is a great guy. He takes pride in his skills and has been a pleasure to work with. Ok back to the kitchen. Now that we’re discussing cabinets, we can begin talk of countertops. 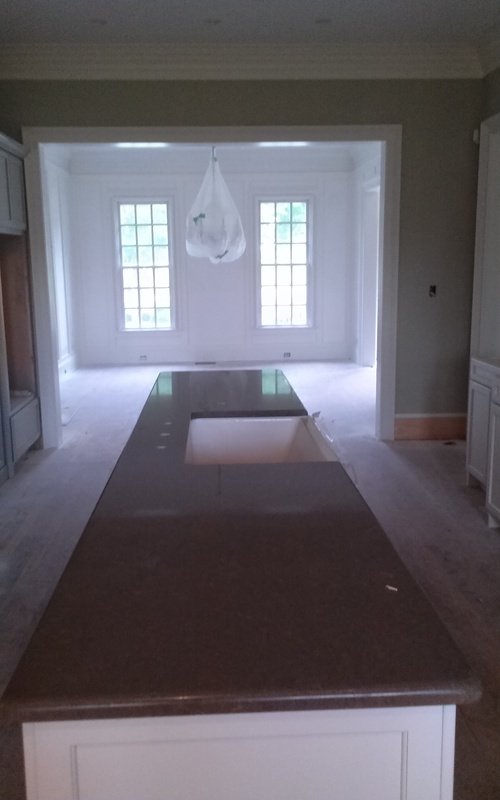 The homeowner, Jill Taylor, and I have been all around town selecting the granite and quartz that will be going into the new kitchen. Quartz will go on all counter-height surfaces. With the more decorative, exotic granite going on the floating, raised bars. (For more info on selecting countertops, check out my series ‘Counter Culture’ Vol.I, Vol. II, Vol. III) Enough with the shameless self-promotion. As for appliances, one of the two raised, floating bars will have the ultra-nice 48″ Wolf cook top. Both bars will be topped with exotic, hand-picked granite. The center island will house the porcelain farmhouse sink. The refrigerator will be a double door Sub-Zero. And the double wall ovens will be Wolf also. As I stated in the very first article, Jill is quite the chef and quality appliances are a must. 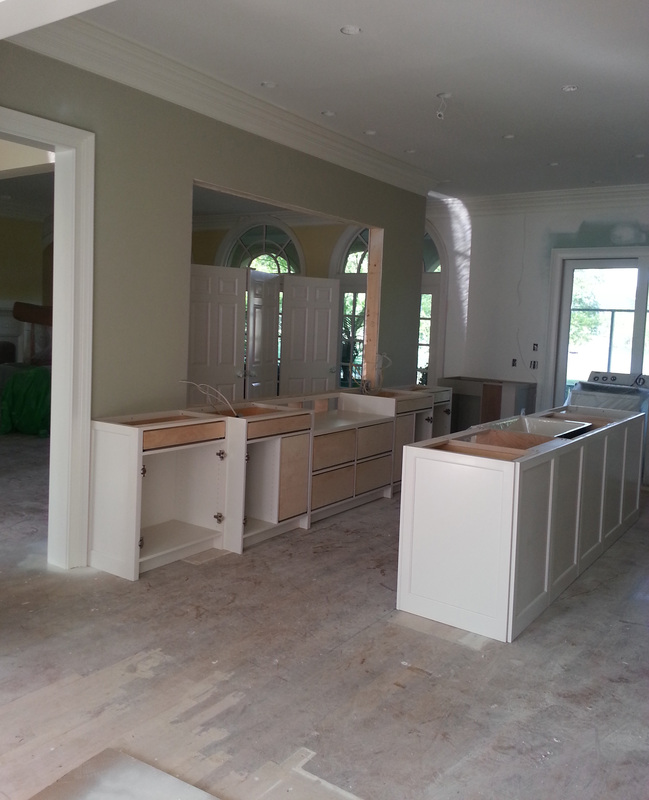 With all appliances and countertops selected, and sheet-rocking complete, the cabinets began. 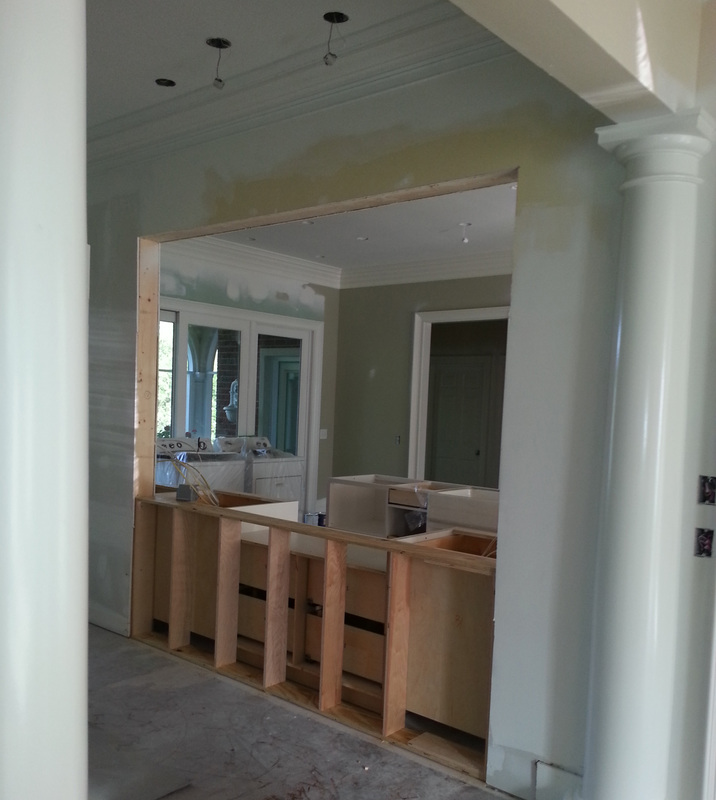 This shot is from the dining room, looking into the kitchen, at the opening to the family room. You can really get a feel for the openness. Connecting not only the dining room, but the family room too. That large opening will keep people from feeling closed off. And, as anyone who has cooked Thanksgiving before can attest to, keeping people out of the kitchen but still included in the conversation is huge. Note: The washing machine photobombed this one. It’s supposed to be in the laundry room, doing its homework. Below is a shot from the family room, looking into the kitchen. There will be an over hang bar in the family room that will seat 5. With three bright can lights over head, this will be a beautiful highlight to the family room. And a real (designer buzz word alert) focal point. So, as we discussed, you can have people feel included in the kitchen and participate without them wandering around, lifting up pot lids, and asking why you’re not basting more. Great, now the dryer’s joined in. Plus a sneak peek of the countertops. And some gloves! In the dining room, I suggested we remove the beadboard wainscoting as it was a little too traditional in comparison with the new kitchen. 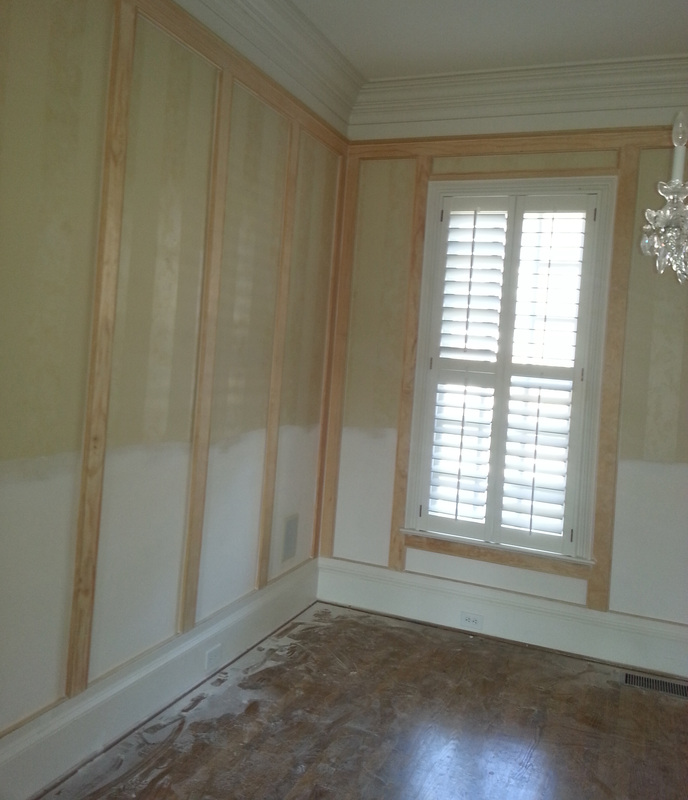 Instead, there will be wood panels every few feet, just to break up continuity and add some interest. This the same angle we’ve used in the last couple posts. Standing at the back of the kitchen, looking into the dining room. The family room is to the right. Spoiler alert: Here’s one section of countertop with the sink cutout. Obviously this picture was taken a couple days after the ones above. You can’t stop progress. But you can see the countertop, sink cutout, AND the kitchen walls have been painted. Forgive the dark picture as there are no lights up yet. But the wall color is called Grey Mirage by Benjamin Moore. It will be shown off in future pictures. As happens sometimes, renovations begat renovations. In this instance, the homeowner decided to redo the foyer floor, a complete overhaul of their master bathroom, as well as as re-design of the fireplace in the family room. The foyer will now have a wood and tile combo to calm the formality of the previous marble floor. The bathroom is getting a new shower and stand-alone tub. I will include all of these pictures in the final post. Oh and one more thing. All the floors in the house are being refinished once the renovations are complete. Otherwise the floors would have construction grade paper and plastic to prevent any damage. Also, I was informed by Jill that she has chosen not to see the kitchen until it’s finished. For a big reveal à la an HGTV show. I appreciate the vote of confidence as I know she will love it! This entry was posted in Design Stories and tagged cabinetry, Countertops, Kitchen remodel, quartz, renovations, sub-zero, wolf. Bookmark the permalink.